I love anniversary releases. Yes, I know I’m often being taken for a ride by record companies, but I just can’t avoid the new and shiny release from some of my favourite artists. All they have to do is slap a limited edition sticker on the cover and I’m there demanding they take my money. It is an illness, but at least I can acknowledge I have a problem. Just as they will never cease to repackage and reissue products that I already own, with new and never before seen photographs et al, I will never stop buying these anniversary editions for my record collection. Abba acknowledged their 40th Anniversary with a plethora of releases that included Live At Wembley Arena, a reissuing of their vinyl collection and an incredible 7-inch singles vinyl box set comprising of 40 singles released during their illustrious career. Yes, as a life-long Abba fan, I purchased all the 40th Anniversary releases. I just couldn’t help myself, they are Abbatastic! 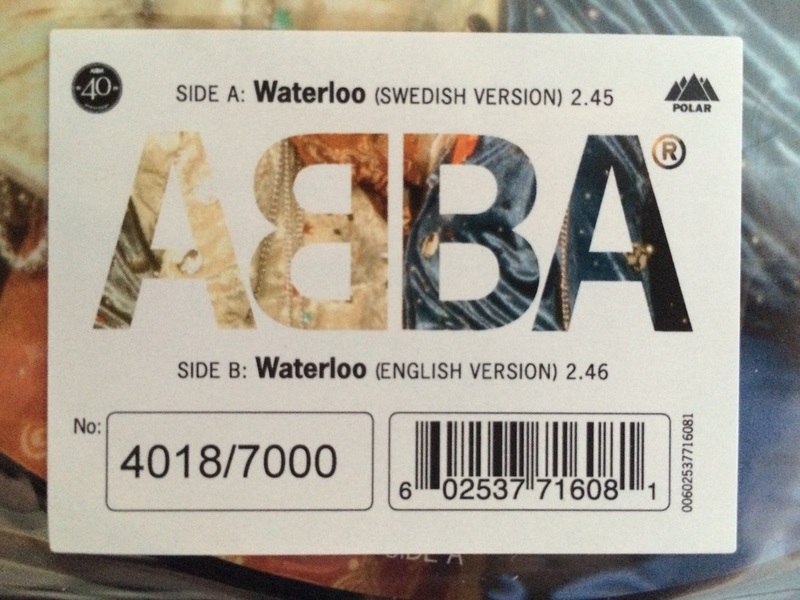 One of the releases, also released as part of Record Store Day 2014, was Abba’s Waterloo 7-inch 45rpm Vinyl Picture Disc. I have number 4018 of 7000. As you can tell by the photographs, it is simply gorgeous with the band featured on Side A and their logo and 40th Anniversary logo featured on Side B. Side A features the Swedish version of Waterloo, with Side B containing the English version. I have always found these variations in language to be interesting. While I speak no other language than English, I still enjoy Abba’s music when recorded in foreign tongue. Although, because Abba’s music encourages one to sing-a-long, they become a little bit of a humorous tongue twister during karaoke nights. What isn’t twisted is the sonic quality of this release. Vinyl picture discs are often ridiculed for the sonic inferiority and while my Iron Maiden Seventh Son Of A Seventh Son picture vinyl is hideous, all Universal Music picture discs in my collection, including this Abba release have been superb when it comes to sound quality. Yes, you still experience the whirring sound that is associated with picture disc vinyl, but it is certainly not intrusive to the music or the listening process. I honestly only notice it on the run in and out tracks. Let’s just say, I’m not one of the individuals that believes picture disc vinyl shouldn’t be played; unless it is etched of course. Hence, I accept the shortcomings and simply enjoy the record as a musicphile, rather than an audiophile. The mastering on this single is also one of the best I have ever heard for the song Waterloo. Abba has a unique sound and some may argue with me, but I believe that the audiophile mind has to be switched off when listening to Abba. Their music is enjoyable, but it isn’t necessarily a sonic masterpiece. After all, it was aimed and marketed for radio playback, so just as the ‘loudness wars’ is creating a distinct sound, I believe Abba represents a similar style of sound that is very much lodged in the late 70s and early 80s. That isn’t to say it is bad, just that when referring to the quality of the mastering, the difference must be acknowledged. Waterloo itself is a fun song, as most Abba tunes are; especially in their early career. Waterloo is a love song that uses the 1815 Battle of Waterloo as a metaphor for submitting to love, just as Napoleon submitted to defeat. The single itself came from Abba’s similarly titled second album Waterloo, and resulted in the band winning the highly coveted Eurovision Song Contest in 1974. Depending on where you are in the world, this limited edition is likely only available on the second hand market. That said, thanks to the Internet Audiophile Reference Recordings and Utopia Records still have stock. You can of course listen to Waterloo (Swedish Version) and Waterloo (English Version) on TIDAL Hi-Fi.